Purpose: Invocation of Raphael for Air initiation. Last night, after spending the previous day meditating on his name in Hebrew, I invoked the angel Raphael to begin the air initiation. I spoke the incantation as usual and waited for a sign he was present. instead of a floating feeling, the crystal appeared to expand and contract in size and I got a “push me pull you” feeling. I asked if he was present and I saw two alternating letters in the shew stone : A followed by R, repeated over and over. I took this to mean “archangel Raphael”. Considering he is the angel of science and learning, it would make sense he would use letters to communicate. I asked for the initiation and he told me “Allow the winds of air to sweep through your sphere and drive away all fecundity”. I then asked for his sigil. Immediately the first thing that popped into my head was the same sigil as for Uriel, but oriented upwards instead of downwards. This too makes sense I guess. I recorded the sigil and released the spirit. Immediately I felt better. Today I feel as if s weight has been lifted off my chest. I feel airy and free, and in good spirits. A much needed change from the Earth initiation. 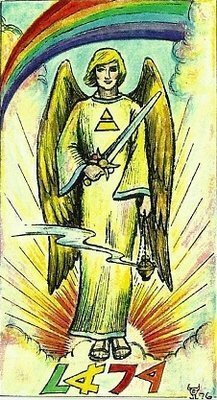 I finished the night by giving devotion to Hekate and the performing the NAP relaxation ritual followed by meditating on the Prince of Swords from the Thoth deck. Also of note, the NAP ritual tends to trigger almost immediate deep trance in me now. I also didn’t expect that. I generally feel as if I am making progress here. Purpose: To evoke the Air prince Paymon to complete my air inititaion. Incense: I’m out of charcoal bricks! Had to use stick sandalwood instead of frankincense. Last night I performed the final part of the air initiation. I created the lamen of Paymon and set up the altar as usual. First evoked Raphael as the angel under which this work was proceed under. I said the evocation and asked if he was present. I had to wait a long time, I had a very hard time connecting to him. I didn’t see much in the crystal, and got very little “phenomenon”. Finally I did hear him tell me to proceed. I then evoked Paymon. I asked for visible appearance and “heard” him say that he was unwilling to do. I insisted (probably not smart in retrospect). I received a vision, but it “smelled” like a fantasy to me and didn’t feel real. I challenged the vision in the name of Raphael and it dispersed. Still he WAS present. I could hear him loud and clear. I’m getting better and determining the voices in my hear from real spirit speak. It sounds different. I asked again to appear in visible form and he still maintained that he was unwilling. He also then told me that just because Amaymon did, does not mean that he will and each spirit is different. Don’t expect all experiences to be the same. I guess this makes sense. Amaymon, the prince of Earth probably has no problem appearing physically, where Paymon the prince of Air is less “physical”. Ok, I relented and just asked for the initiation. He agreed and basically said “Wait for it, incoming” (I’m paraphrasing obviously). I felt a slight tingle, but nothing major. He then said: “Done. Now there’s something else you need from me, ask it”. I asked for his sigil and immediately it appeared strong and clear. I copied it. He then said “I’ve done what you’ve asked, now release me”. So I did. He was very different from Amaymon. Where Amaymon seemed down to Earth (ach an inadvertent pun), Paymon was all business like and curt. It was good advice though, about different spirits appearing differently. Also a note, its a waning moon AND mercury retrograde. I wonder if this is why I haven’t had strong visuals with the air initiation like I did with the Earth. Anyway Fire is next this week. I have to admit that I’m very excited to work with Micheal. I’ve done some work with him before, but never formally evoked him. This should be interesting.